Endorsement ads are often suspect. When stars recommend a movie, you can usually detect some benefit accruing to them for having done so. Warner players would often rave in print over Warner pictures --- one hand washing the other. Then there are those occasions when the product really does merit praise, and the celebrity kudos neither bought nor coerced. Sunset Boulevard was a show that got attention, particularly in the town it dissected so brilliantly. I’ve no doubt that everyone in the industry wanted to see it, and most would likely be impressed, if not made a little uneasy by it. Could all of this happen to them someday? Yes to that, for many a Norma Desmond plies his/her trade most weekends at far-flung autograph shows. The only difference is most of them don’t have crumbling Hollywood mansions to go home to. I’m not sure that even Norma could have been reduced to peddling her signature for $15 a pop in some hotel ballroom, but her modern counterparts are sure doing it today. Looking over this ad, I see a few stars that were in bed with Paramount at the time --- Barbara Stanwyck, Joan Fontaine, Loretta Young --- were they just greasing some wheels, or did they really like Sunset Boulevard? Well, the question might be better put, How could they not like Sunset Boulevard? Joan Crawford often endorsed the other man’s product --- she was generous that way. Bogart was nobody’s whore when it came to recommending movies --- this is the only time I can recall seeing his name attached to an ad blurb. 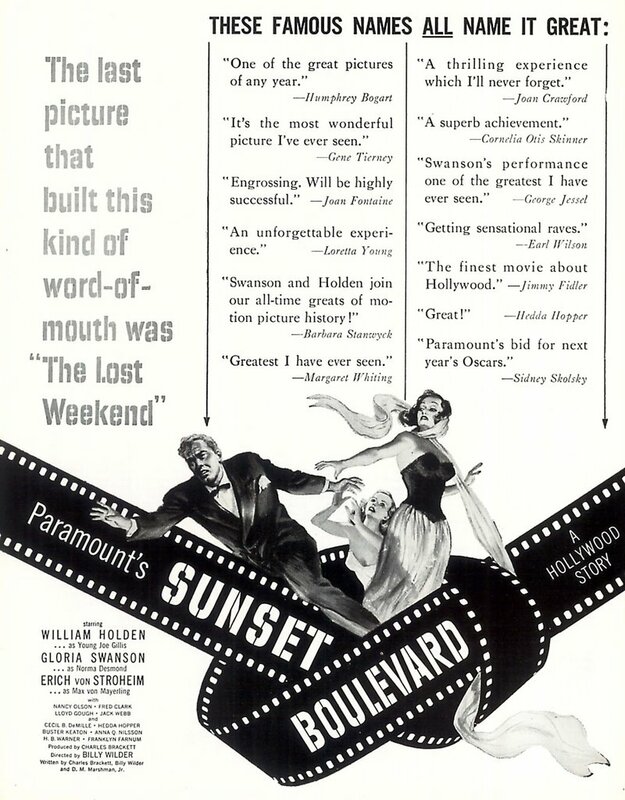 The columnists here were in the business of promoting films, so no surprises there, though I wonder if Hedda Hopper refers to Sunset Boulevard or her performance in it (Great!) --- probably both, and she’s right. Stanwyck, it will be recalled, dramatically (and famously) knelt to kiss the hem of Swanson's dress after an early industry screening; she was also a firm backer of Holden and Wilder of some years standing. I also liked the quotes from not- strictly- industry- types like Margaret Whiting and Cornelia Otis Skinner.